Description: Alpha is a series of sessions exploring the Christian faith. Each session looks at a different question around faith and is designed to create conversation. Alpha is run all around the globe and anyone is welcome. It runs in cafés, churches, universities, homes -- you name it. No two Alphas look the same, but generally they have three key things in common: food, a talk / video, and good conversation. 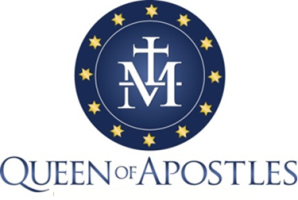 We are excited that Alpha is returning to Queen of Apostles + Saint Anthony on the Lake churches. Alpha consists of 11 sessions and a day away. Tuesday evening sessions take place at QOA and Thursday morning sessions take place at SAL. Childcare is available at SAL. Each session lasts roughly 2 hours and includes a meal, a video, and a small group discussion. We begin Sept. 27 / Oct 2 and end Dec. 13 / 16. Description: Fulfilled: Uncovering the Biblical Foundations of Catholicism is an apologetic approach to sharing the Catholic Faith using the Old Testament Tabernacle as a blueprint for God's plan. While it is designed as a faith-sharing Scripture study, you will also gain an understanding of some of the most questioned Catholic teachings. Fulfilled will reignite your love of Scripture and help you share and defend the Catholic Faith with the Word of God. Join us for Part One (seven sessions on Wednesdays starting October 17 - December 5, 2018) which focuses on the elements found in the outer sanctuary of the Old Testament Tabernacle and how they connect to the liturgical calendar, the priesthood, purgatory, baptism, and more. Part Two will follow in January. Contact Liz Kuhn (262) 691-1535 x108 or Paul DeBruyne (815) 218-6436 for additional information and to register. Alpha is a series of sessions exploring the Christian faith. Each session looks at a different question around faith and is designed to create conversation. Alpha is run all around the globe and anyone is welcome. It runs in cafés, churches, universities, homes -- you name it. No two Alphas look the same, but generally they have three key things in common: food, a talk / video, and good conversation. Fulfilled: Uncovering the Biblical Foundations of Catholicism is an apologetic approach to sharing the Catholic Faith using the Old Testament Tabernacle as a blueprint for God's plan. While it is designed as a faith-sharing Scripture study, you will also gain an understanding of some of the most questioned Catholic teachings. Fulfilled will reignite your love of Scripture and help you share and defend the Catholic Faith with the Word of God.